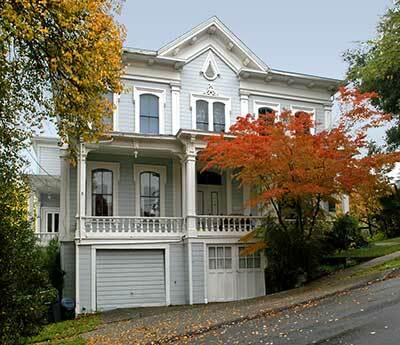 Originally located at 40 Escobar, this luxurious mansion was built for Capt. 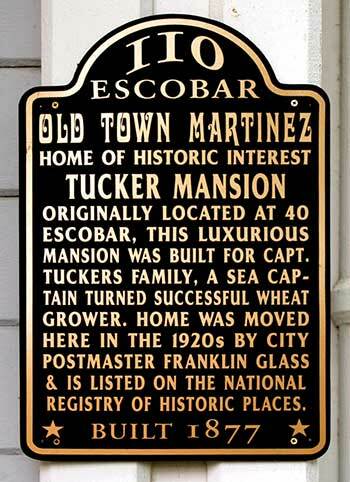 Tuckers family, a sea captain turned successful wheat grower. Home was moved here in the 1920s by City Postmaster Franklin Glass & is listed on the National Registry of Historic Places. It's not just that the people of the American West are restless, the buildings themselves sometimes pack up and move when - for one reason or another - the neighborhood no longer suits them or the neighbors no longer want them or opportunity waits down the road. And when buildings remain in place, they are often searching for their identities. Of the buildings and structures we have visited, the original Reno Arch holds the record for number of moves. It has been moved five times since it was built in 1926. Jax Truckee Diner holds the distance title. The building moved from New Jersry to Pennsylvanis in 1948, then from Pennsylvania to Califonia in 1992. Probably the most ambitious relocation occurred on July 4th 1904, when the Southern Pacific Railroad loaded most of the town of Wadsworth, Nevada, onto rail cars and transported the town thirty miles west to create a new town which became known as Sparks.